A car first aid kit, in case your car becomes poorly. That link shows various kits including HGV and tractor kits?!!! I'm not knocking the deal, and don't flame me, but I do doubt the value of all the bandages you get in these small first aid kits. I sort of think if an injury is so serious that it needs a bandage, that it would better done by a paramedic when they arrive, and if you were in a remote area where there was no phone coverage then torn up clothing could serve as emergency dressings. Obviously if you are properly trained and could then help early on at a serious incident then having bandages would be helpful, but then wouldn't you be better off with a more comprehensive kit? Because I'm not first aid trained (every year I say I will do a basic course, but never do) my own portable kit just has things that I feel I'm more likely to find helpful, plasters, OTC pain killers, antiseptic, antihistamine sting cream etc. 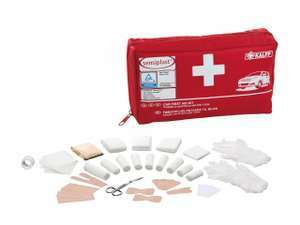 First aid kits are something which you hope you will never need but also something which if needed can literally be a lifesaver.....loads of different ones/types/sizes on the link I posted earlier. Thanks OP We have a few of these in our family. I think they are very good, reasonable selection of items that meet the criteria for Car regulations in EU countries that specify a suitable 1st Aid Kit must be in Vehicle, the ones we use have expiry dates on them, so have to be renewed every few years. Been a while now but I went on a few First Aid courses and its handy having one of these in the car and in the house, especially if you have children, even if you only use the plasters then at least you have something handy. I'm not knocking the deal, and don't flame me, but I do doubt the value of …I'm not knocking the deal, and don't flame me, but I do doubt the value of all the bandages you get in these small first aid kits. I sort of think if an injury is so serious that it needs a bandage, that it would better done by a paramedic when they arrive, and if you were in a remote area where there was no phone coverage then torn up clothing could serve as emergency dressings. Obviously if you are properly trained and could then help early on at a serious incident then having bandages would be helpful, but then wouldn't you be better off with a more comprehensive kit? Because I'm not first aid trained (every year I say I will do a basic course, but never do) my own portable kit just has things that I feel I'm more likely to find helpful, plasters, OTC pain killers, antiseptic, antihistamine sting cream etc. If something is bleeding. Apply pressure. Best thing to use is a sterile bandage. Don't want to be ripping up your clothing. Bandages don't need to be pretty. Just apply. Don't keep looking to see if it's stopped bleeding and get the person to hospital either via ambulance or another way as ambulances are really stretched thin at the moment. If something is bleeding. Apply pressure. Best thing to use is a sterile …If something is bleeding. Apply pressure. Best thing to use is a sterile bandage. Don't want to be ripping up your clothing. Bandages don't need to be pretty. Just apply. Don't keep looking to see if it's stopped bleeding and get the person to hospital either via ambulance or another way as ambulances are really stretched thin at the moment. That sort of sums up my point. If someone has a hole in them, then plug it to stop them leaking. Obviously if you have something sterile, that's better, but most people have tissues or whatever to hand, and that's not far off, as if it's serious enough to warrant professional attention, it will soon be there. In my kit I have a reel of adhesive plaster tape that can be used to hold a dressing, or makeshift dressing, on a minor wound, but takes up loads less space than bandages, and can even be useful for non-medical applications. If it's worse than that, and they are leaking really badly, then needs must and use whatever you can to put pressure on the wound till a professional can take over. I do think there is a problem with the sort of basic first aid kits out there. They are all made up to fit standards, apparently DIN 13164, in this case. But it makes them useless for lots of common minor ailments, but not a huge use for major injuries, particularly because most people aren't trained to use them.